We will have four elections this spring. It's great to have many candidates vying for positions, but so many elections seems silly and wasteful to me. 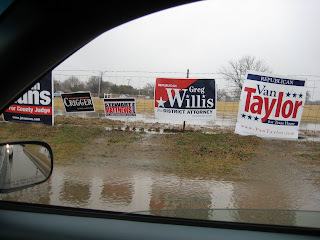 This photo was taken in rainy early February before the statewide primary election, our second election of the year. We had already voted in a special election to fill a city council seat, but that election went to a runoff. Early voting in that runoff between Davidson and Fang is in progress but I can't remember if it is partisan or nonpartisan. Still ahead we have the state primary runoff in April. Then there are county and school district elections in May. I try to be a responsible citizen, but I'm nearing voter overdose. On the upside, many Collin County old folks are finding frequent employment as early-voting poll workers. Let's put Americans back to work by having more elections! ?